I am traveling next week on VA Airbus metal from SFO to PVR in F.
Do they still have Live TV or Satellite Internet on board? I wanted to stream or watch a live soccer game whilst flying if available, is that possible? Satellite internet: maybe, but probably not. It looks like they usually use 319s and 320s on that route. None of the 319s do, and some of the 320s but not many have it. There is viasat on N282VA. Is that plane usually deployed on the SFO - PVR Route? Not sure, I flew SEA-LAX. It was my first ever AS Airbus flight. Return LAX-SEA was on the same plane 2 days later. I was in F down and Premium back. They were the worst two flights by a longshot I have ever flown under the AS Banner. 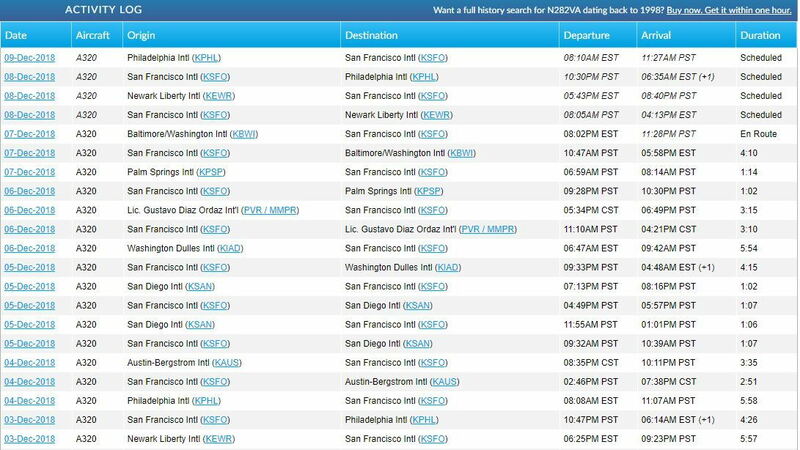 Looking at the history for N282VA it lookes like it has been doing transcons out of SFO the last week with the odd West Coast thrown in. SFO<->EWR & SFO<->PHL is scheduled on the 8th & 9th. Currently en route back to SFO from BWI. It did a SFO<->PVR & a SFO<->PSP on the 6th and the morning flight to BWI on the 7th. Last flight to Mexico was to SJD on November 30th. Do you happen to know if you are going to be on an A319 or an A320? You can tell from the seat map. None of the 319s have satellite, and 10/53 A320s do. In any case, Viasat does not work over Mexico, so you'd only have an hour or less of usable service even if you ended up on one of the planes that have it. Maybe you get lucky and they swap in an A321 or a 737 with 2Ku at the last minute, but I doubt it. COuldnt find out if 319 or 320 but flight 1270 on 11th Dec is what i am flying out on. It varies, but more likely an A320. The seat map on the 11th is showing an A319 layout, but it's possible they swap in something bigger. In any case, [url=https://www.alaskaair.com/content/travel-info/flight-experience/inflight-entertainment/wifi]Viasat does not work over Mexico, so you'd only have an hour or less of usable service even if you ended up on one of the planes that have it. I believe the reference you cited is for the old Gogo air-to-ground coverage, not ViaSat, with regards to coverage over Mexico. "Fast streaming service is available over the continental US, with basic internet service between the US mainland and Hawaii. No internet is available when flying outside the continental US to Alaska, Mexico, or Costa Rica." I’m curious why it was the worse? All of the pmVX planes have the hardware for satellite TV, but it was disabled a while ago. As far as internet goes N362VA- N365VA, N281VA-286VA, and N921VA-N925VA all have viasat which should work into Mexico. In addition N926VA-N928VA have Gogo 2ku which is also satellite based and should work in Mexico. If you are flying on a plane that wasn’t listed, expect an hour or so of useable WiFi and then radio silence.